An ENTIRE apartment unit ALL TO YOURSELF on Spencer St, right opposite the Southern Cross station marks this superb inner-city residence a must for any weekenders, business travellers or holidaymakers. Fully furnished with FREE WiFi and access to the pool, gym, sauna and rock climbing facilities. Spacious for 1, roomy for 2, ideal for 3, accommodates a maximum of 4. A fantastic location fused with modern and heritage architectural facades dating back to the 1800 s.
This magnificent self-contained apartment unit houses a generous bedroom with a queen-sized bed. A warm and cozy en-suite. A very spacious living area with a comfy 3-seater sofa bed that folds out to a queen. A study bench. A fully decked kitchen and dining. Complimentary coffee and tea. A laundry area with a washer, dryer, iron and an ironing board. A private balcony with a great view of the CBD. If you want to leave your luggage before checking-in or after you check-out, there are affordable luggage services and paid lockers across the road at the Southern Cross train station. They charge anywhere from AU$10 to AU$16 per locker for 24 hours worth of storage. The sleeping arrangement for the 3rd and 4th adult would be on a 3-seater sofa bed which folds out to a queen with extra quilts, pillows, sheets & covers. Please do let us know beforehand if you would like us to pre-make the sofa-bed prior to your arrival. If you plan to bring your kid(s) along, please take note that this property has a balcony with a sliding door. You may still book at your own risk. Check-ins are anytime after 2pm. If you plan to check-in after 10pm, there will be a once off AU$19 surcharge. Check-outs are strictly before 10am. Melbourne CBD boasts a network of historic laneways and arcades, offering designer clothes boutiques, al fresco cafes, funky coffee shops, hip clubs and bars just waiting to be discovered. Awesome and extremely convenient surroundings. We're situated on Spencer Street right next to the Southern Cross train station with access to everything all under the one roof. 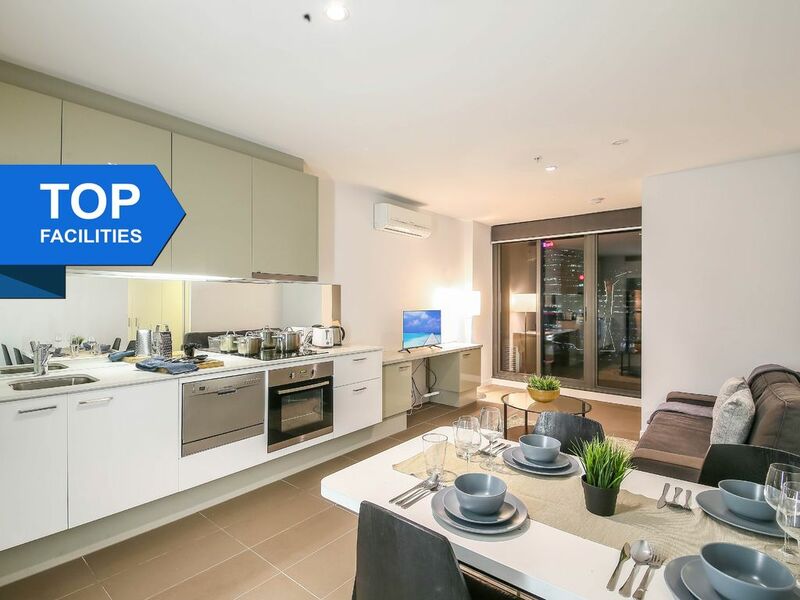 Enjoy the convenience of Woolworths Express, over 40 retail stores and cafes, with direct access to Etihad Stadium, Melbourne's Docklands precinct, the CBD and Spencer Outlet Centre. There are tons of things to do in the city itself which are mostly a quick stroll away. Needless to say, surrounded by trams, cabs, buses and situated right next to the Southern Cross station, getting around is not going to be a problem at all. Hop on board the Skybus which provides a quick, convenient and cost effective way to get to and from the airport. Access to the Overland rail service to Adelaide, and NSW TrainLink XPT services to Sydney. Coach services to Melbourne Airport and Avalon Airport, as well as regional Victorian and interstate destinations. Europcar, Budget and Avis rental car depots are just opposite the building in the Southern Cross station, so picking up and dropping off a rental car is super easy! There is also a tram stop right outside the main entrance on Spencer Street. Most importantly, all trams within the city grid are FREE. Just look out for the "FREE tram zone" signs.